Oily fish such as anchovies, herring, mackerel, salmon, sardines, trout and tuna store fat throughout their flesh, rather than concentrated in their liver. The natural fats in oily fish lend a darker colour and stronger flavour to the flesh, which is altogether richer than lean white fish. This is why oily fish is often paired with tart flavours, as you need something that can cut through the fattiness. 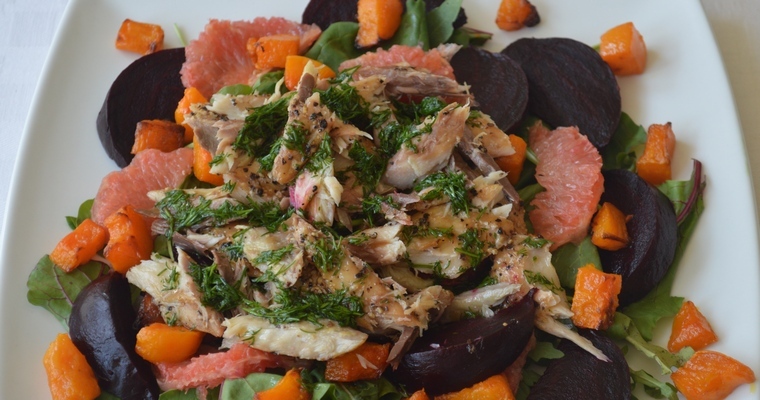 The mackerel and grapefruit combination in my recipe creates a fresh and zingy plate of food, balanced by the earthy sweetness of roast beetroot. Roast the vegetables. Put the beetroot on a piece of foil and drizzle with olive oil. Scrunch the foil into a parcel and place in a roasting tray. Roast for 1 hour, or until the beetroot is fork tender. When the beetroot has been in the oven for 15 minutes, add the butternut squash. Arrange the squash pieces in a single layer in the same tray, giving them plenty of room to roast and caramelise. Drizzle with olive oil, and toss until evenly coated. Roast for 45 minutes, or until the squash is browned and fork tender. Once cooked, remove the vegetables from the oven and set aside to cool. They can be done a day or two ahead and stored in the refrigerator. When the beetroot are just cool enough to handle, brush off the skins using a piece of kitchen towel. Cut in half lengthways, then slice into wedges. Segment the grapefruit. Cut off the top and bottom of the grapefruit, deep enough to leave a round of flesh at either end. Stand upright. Cut away the skin and pith, cutting downwards and following the contours of the grapefruit. Hold over a bowl to catch the juice while you cut between the membranes to release the segments. Make the dressing. Combine all the dressing ingredients in a jam jar, and shake vigorously until blended. Assemble the salad. Layer the salad leaves on a plate. Scatter over the beetroot, butternut squash and grapefruit. Pile the smoked mackerel on top. Spoon the dressing over just before serving.